Look no further. 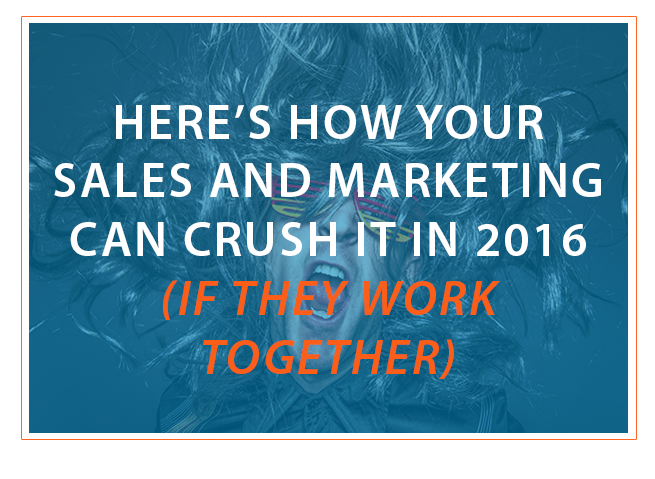 If you want the numbers to prove that your sales and marketing CRUSHED IT in 2016, get your marketing and sales teams aligned. Yes, you read that correctly: A lack of sales and marketing alignment plagues even most of the best companies, but you can learn how to turn that ship around right now, steering towards victory instead of defeat! The problem with having a house divided is that it often seems like business as usual. Based on a study by Aberdeen Group, only about 8% of companies have a tight alignment between sales and marketing. When our teams are out of whack, we see a typical but dysfunctional system and look the other way. Each department has its own separate or even contradictory message to customers. Your sales and marketing each see their own department as vastly more important than the other. The success of your marketing department is judged apart from the success of sales. Your sales department doesn’t get involved in marketing creation by giving customer feedback to the marketers. Marketing tries to prevent sales from reaching out to leads early on in the nurturing process. But what are the reasons sales and marketing fail to work together? Ideally, every company wants their whole system to work in unison! Some leaders respond by simply pretending that there is harmony when there isn’t, and others just count it as a loss. Still others try to just demand a fix without identifying the sources of the problem. Undervaluing the other team’s importance. Sales thinks that marketing is just a bunch of inflated artists and technicians. Marketing assumes that sales is just a human checkout counter. Neither one knows how hard business life would be without the nuances the other team brings. Competitiveness goes too far. A little healthy competition is good, but when the company separates into distinct clans where each hopes the other loses, nobody wins. Different roles in the company are too isolated. When marketing and sales don’t even communicate, they can’t work together. Nobody feels animosity; the sales guys are just some foreign species and the marketing dudes are a strange beast. Ideas stay in one place and nothing works smoothly together. Sales and marketing have incompatible goals. For example, if sales wants to close 100 leads but marketing only wants to provide 50 leads, both sides are going to feel friction and discord. Additionally, if the goals aren’t SMART goals, then it will be nearly impossible to monitor or share the values each team is striving for and what they’re actually accomplishing. The success of sales and marketing are often not tied together by management. Companies are often subdivided theoretically into smaller and smaller factions. Usually, managers want more microscopic views in order to reward and punish on the most individual level possible. The whole plan backfires when the company’s sales decline. Sales blames marketing and marketing blames sales. Neither one wants to come up with a joint solution because the damage can always be compartmentalized in the other group. The problem gets even worse after one side takes the blame, because then they’re tasked with fixing it alone even though the solution is in the other department. 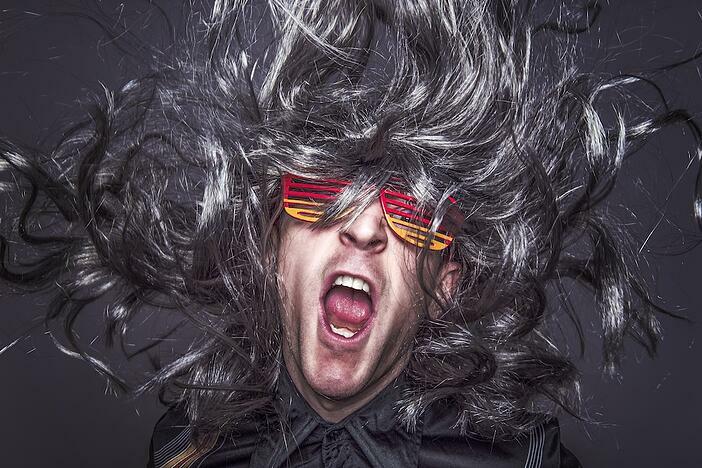 This is what you’ll see when sales and marketing get on the same page. Marketing will get most of their feedback on what gets customers to close from sales. The marketers will then integrate this information into the marketing messages. After all, obtaining marketing leads means nothing if they don’t become a buyer. Lead quality and close rates should drastically improve. Sales and marketing will find new ways to aggressively tackle qualified leads at the most pivotal times. Sales will start calling strong leads earlier in the process, and marketing will continue nurturing leads longer when they have weaker sales indicators. Now we’ll tell you what a good leader can do to foster alignment between sales and marketing. While it’s hard to make a perfect system, it’s easy to start improving it! The first couple of things you can do to start things in the right direction can be done immediately. The first step to alignment is creating a common language for your sellers and marketers. Create a common list of key terms that both teams build, agree upon, and access routinely. Your definitions should include how to qualify leads, what talking points are used to promote your products or services, and what the buyer’s journey looks like for your customer. Both teams should be excited about being understood clearly with these new definitions. The positive energy will foster new cohesion as well. Don’t separate sales and marketing with physical walls. If they’re in the same space speaking the same language, your teams will begin to align philosophically. If you can’t put the teams together all the time, at least have them meet together frequently. Push a discussion, because the continual rifts between sales and marketing indicate that the problems don’t always rise to the surface on their own. Make sure that each team gets to see and understand the complexities, challenges, and skills inherent in the other role. Watching someone else at work makes one realize that there was much more going on. Alignment is about strategy, not just tactics. For sales and marketing to operate on the same page, they need a unified strategy. If you lack a strategy, there isn’t even a common banner under which they can unite! When you create your inbound marketing strategy, get both teams in the room. Start out with sales and marketing alignment at the core and you won’t have an issue implementing the rest of what we suggest to help sales and marketing crush your 2016 inbound lead generation goals!